Want to do bodyweight pull-ups but haven’t quite got there? Currently at a sticking point with your training and not progressing as quickly as you’d like? Let’s change that. Band assisted pull-ups are one of my favorite exercises for progressing to unassisted bodyweight pull-ups. Unfortunately, many trainees are not getting the greatest reward possible from this seemingly simple exercise. There are a couple important training cues you want to apply to get the most from this excellent exercise. Doing so will have to progressing quicker to a good ole bodyweight, unassisted pull-up (or chin-up, if you prefer). In addition to seeing how to correctly perform a band assisted pull-up, you’ll also see how to make the exercise a bit more advanced so you can progress even quicker to unassisted pull-up variations. In some training circles the band assisted pull-up isn’t a favorite method for working toward an unassisted pull-up. Now, I will say that some trainees would be better off starting with a cable pull-down variation before switching to band assisted pull-ups. For example, trainees who have a good amount of excess fat to lose would likely be much more comfortable, and be able to make greater initial progress, using a cable pull-down variation. The next time you perform a band assisted pull-up (or chin-up, neutral grip, etc), please be sure to apply . . .
Start from the bottom hang position with your foot, or feet, in the band (keep your shoulders down – they should not be touching your ears, as seen in the photo above). Pull yourself up to the bar (yes, this is obvious). Take a good 2-4 seconds to lower back down. This is the important part when doing band assisted pull-ups. Make your muscles do the work and lower slowly. Pause in the bottom hang position (again, keeping your shoulders down) for a solid 1-2 seconds. This is important! Repeat for the prescribed number of reps according to your strength training program. By pausing for a solid 1-2 seconds in the bottom hang position you’re removing the bounce out of the movement. This is a mistake some people make: they lower too quickly and use the natural “bounce” of the band to spring back up. As a result, their muscles aren’t doing as much of the work. This means the exercise isn’t as effective as it could be. Watch the demonstration video below and be sure to pay attention to the controlled lowering portion and the pause in the bottom hang position. The next time you perform band assisted pull-up variations put those coaching cues into practice. Doing so will make this more effective and help you progress toward performing bodyweight, unassisted pull-ups much quicker. You’ll likely also feel this much more in your lats than if performed this exercise with a “bounce” out of the bottom of the movement and rushed the lowering phase. Once you’re stronger with band assisted pull-ups and can use a small band for assistance (as shown in the video) but you aren’t quite ready for bodyweight pull-ups (or you can currently do 1-3 bodyweight pull-ups but want to increase that number) you can move on to the advanced band assisted pull-up variation. I’ve only been using this variation recently, but with good results with trainees. For the advanced variation you’ll reduce the assistance for the lowering portion of the movement because you’re naturally a bit stronger during the eccentric (i.e. “negative”) portion of an exercise. To further explain, you’ll perform the negative portion of the pull-up with less assistance from the band, meaning you’ll make your muscles do more of the work when lowering. This will be achieved by tucking your legs toward your chest so you don’t use the band for as much assistance on the way down. Once lowered to the bottom position, extend your legs (to stretch out the band) and use it for assistance to pull back up to the top. Here’s the demonstration video as well. This is a more challenging assisted-variation and is an excellent exercise to progress to bodyweight pull-ups. You can also apply the practice-technique to further increase your rate of progression, if you so desire. These techniques can also be applied quite effectively to parallel bar dips. Dips are one of my favorite upper body pressing exercises for trainees who can perform them without shoulder pain or discomfort. I tend to lower myself very far down when doing parallel bar dips, but if you want to be on the safe side, stop the movement once your upper arms are parallel, or a bit lower, than your shoulders. And you can apply the same advanced band assisted technique to parallel bar dips to progress toward bodyweight, unassisted dips. Use those two progressions to gradually improve your strength and performance, and eventually you’ll be able to do unassisted pull-ups and parallel bar dips. Why Perform Bodyweight Pull-ups & Dips? If you currently can’t perform unassisted pull-ups and parallel bar dips, why should you make that a goal? (Remember – parallel bar dips should only be performed by trainees who can do them without any pain or discomfort and you may want to limit the range of motion to be on the safe side). For one, bodyweight pull-ups are pretty dang awesome. Being able to do your first pull-up is such an incredible, empowering achievement. (And that’s an amazing benefit to strength training). Second, if you want a great looking pair of arms, working toward bodyweight pull-ups and dips is a great way to achieve that goal. Third, working toward exercises you can’t currently perform is one great way to train to be awesome and focus on what your body can do. If your goal is to get stronger and progress to unassisted pull-ups and dips, then perform 6-8 sets of 3 reps for both exercises. To explain, do a set of 3 reps for a band assisted pull-up variation, rest 30-45 seconds, do a set of 3 reps for band assisted dips, rest 30-45 seconds and repeat for a total of 6-8 sets for both exercises. When you repeat the workout try to gradually use less assistance (either with a smaller band or progress to the advanced band assisted variation). This is a great way to work toward unassisted pull-ups and dips. You can also add a lower body exercise or two to that sample workout to create an effective total body workout. Something like squats, lunges, or rear foot elevated split squats for 3-4 sets of 8-12 reps would work very well and then you could finish off with 3 sets of back extensions or kettlebell swings for 12-20 reps.
What Type of Band Should You Use? 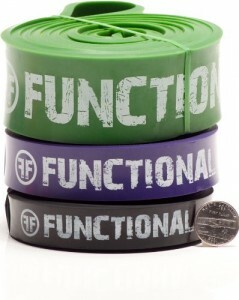 Bands are becoming increasingly popular so you may be able to find a set at your local sporting goods store. I recommend getting a set that has a variety of bands (anywhere from two to four different sizes). This way you can gradually use less assistance with a smaller band. One of my favorite brands that I use is Rubberbanditz and this is a great starter set. That set has three different sizes (as you can see in the photo), and you can always combine them if you need more assistance. Please note: that’s an affiliate link; if you click that link and make a purchase I will receive a commission. You can also find information about the best bands for assisted pull-ups in this article from Bar Bend. Want More Bodyweight Workout Ideas & Exercises? You can also find some of the best free-weight and bodyweight strength training exercises for your upper body and lower body by clicking those links. And if you haven’t done so already, sign up below to get insider-only information and a free gift (spoiler alert: it’s the Beautiful Badass Mini Course).